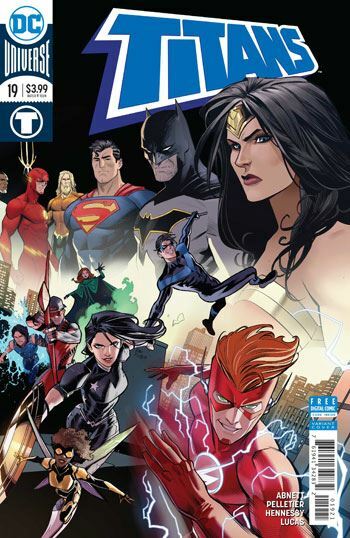 The Titans are in conflict with the Justice League in this issue, but it’s not a matter of fighting things out. 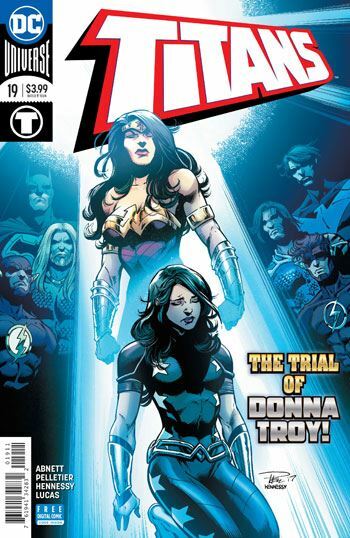 This time, the League is strongly disappointed with the team, and how they handled Troia, the alternate Wonder Girl from the future. This leads to a lot of blame, recriminations, and bad feeling that gets spread around. Fortunately, this issue was scripted by Dan Abnett, who has a strong sense of interpersonal relationships in his writing. That really helps, in an issue where most of the scenes consist of people talking to each other. The conversations between the older and younger heroes, the issues that get raised, and the varying levels of guilt and immaturity with which these are dealt, help carry the issue easily. This makes for a fascinating read. Pelletier and Hennessy do their fair share in making this all work, heightening the emotions through the facial and body expressions they give the team members. It’s sad that Psimon’s forecast seems to have come true, and the team has been torn apart, by the “traitor,” by their own tensions, and by the Justice League. Of course the next thing we will be treated to will be a re-forming of the team. DC isn’t abandoning the book or the concept. It will be interesting to see how the group comes back together, who returns, and who doesn’t.